recognition and enforcement of foreign (judicial and arbitral) decisions. How will my practice benefit from Asian Conflict of Laws: East and South East Asia? Gain practical guidance for non-Asian companies on international litigation and enforcement of foreign decisions in East and South East Asian trade jurisdictions. Valuable resource for practitioners handling commercial matters in East and South East Asia. Provides a major step forward in the ongoing academic and policy endeavors to coordinate efforts in harmonising private international law. 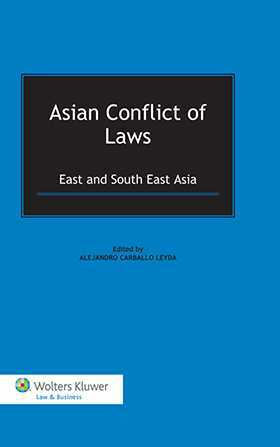 Asian Conflict of Laws: East and South East Asia, edited by Alejandro Carballo Leyda, is primarily designed to increase the knowledge of non-Asian companies on the specific frameworks regulating international litigation and enforcement of foreign decisions in the region, and will thus be of great practical value to corporate counsel and other practitioners, officials, and policymakers. In addition, it takes a major step forward in the ongoing academic and policy debate to coordinate efforts in harmonising private international law in the region.